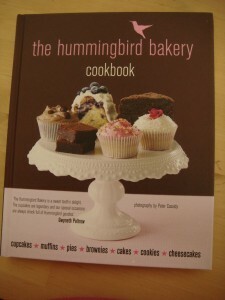 The Hummingbird Bakery Cookbook – Life! Last week, I was reading the reviews for this cookbook on Amazon and there were some really negative ones. One of the biggest complaints was that recipes weren’t turning out right. Those critics attributed the failures to the unconventional methods used. I think the critics may have looked at the method, decided to use their own and thus the reason for the failed recipes. Maddie and I made the chocolate ones while I was in London and they turned out really well. We followed the method exactly. Today Rick and I are invited to a barbecue and I volunteered to bring a dessert. I decided on the Black Bottom Cupcakes from the Hummingbird Bakery Cookbook. I followed the directions just as they were written. In fact, I was quite concerned because the chocolate cake part of the recipe does not call for eggs and it calls for vinegar. I even thought about adding eggs, thinking it was a mistake. However, I resisted the urge to rely on my experience and method and followed the recipe. The only change I made was to double it. I must make big cupcakes because when Maddie and I made the chocolate ones the recipe said it makes 12 and I only got 8. Today instead of 24 I got 19. The bigger cupcakes required a longer baking time. I baked them until a skewer inserted in the middle came out clean. Oh, and just so you know we are not taking 19 to the barbecue we are taking 16. I had to try half of one unfrosted to make sure they worth the 600 yen ($6) package of cream cheese called for in the frosting, then Rick and I each had one with the frosting. They are delicious! 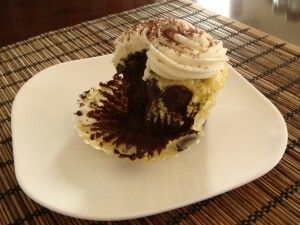 I am declaring my search for the best cupcake completed. I have so many yummy cupcake recipes and I need to visit some good art museums instead. If you are interested in the Hummingbird Bakery Cookbook be sure to use their methods and I everything will turn out just right.